What Can We Do to Attract More Women Into STEM Careers? The UK has the lowest amount of female STEM employees in comparison with the rest of Europe making up only 24% of the workforce1. Those numbers are slowly growing; however, an old-fashioned culture still prevails and needs to change before we see an increase of women happily staying in STEM. Allegra Santis, creative marketing specialist at Oak Intranet, is joined by Dr. Julie Wardlow of Durham University’s Department of Physics. We talk about tech, STEM and how to encourage more women into these lucrative and exciting industries. Why does the industry lack appeal for many women? The lack of women working in STEM is a result of a flawed culture, not incompetence. STEM has historically been male-dominated with few women breaking the mould, such as mathematician Katherine Johnson or “Mother of Nuclear Power” Lisa Meitner (other influential STEM women here). Unfortunately, bias and a rigid working culture is par the course in 2018 and that is turning women away. There is the stereotype that STEM careers are a male pursuit and likelier to face biases while in school or in the workplace. It’s not unusual to hear about discouraging occurrences, such as receiving comments like, “You’re not like other women” or “You’re really a man, aren’t you?”. These comments put women down as a collective and props the stigma that having masculine traits is more desirable in a professional environment. This mindset essentially pits women against each other and says it’s more important to take each other down rather than raise each other up. Another aspect is the worry about sexual harassment in the workplace and how it’s handled. Many university departments and companies still have a bro culture and either remain purposely ignorant or struggle to find incentive to change. Many women feel that if there is a problem, a complaint is likelier to be disregarded or not believed. There is also a fear of retaliation or humiliation – for example, a complaint and name made known to the harasser who then retaliates with more abuse. Without someone on their side, many women feel compelled to quit. How can schools encourage STEM interests? While going to an all-girls school might not be possible for many, schools can become more involved by making conscious decisions to engage girls through encouragement and support. Have STEM ambassadors (www.stem.org.uk/) give lectures, champion teachers to act as mentors, contact social groups, such as Code First: Girls, to develop classes and after-school programs. Form clubs for girls who are interested in robotics, sciences, maths and coding who might otherwise be intimidated to join and partner with local tech companies and universities for mentorship. This all helps generate interest and long-term aspirations. What can STEM industries do? The tech industry can begin by identifying internally why women are not applying or if they are, why they’re not invited to an interview. Most applicants will be qualified for the roles they apply for, however significant gaps in employment can make them look unreliable. For most women, employment gaps are a result of maternity leave, raising children, or taking care of another family member. Rejecting an application on this basis sends a message that taking on a caretaker role completely negates a woman’s knowledge, experiences and success. It’s demoralizing and women either must decide to leave tech altogether, or take on a position where they are underpaid and overqualified. 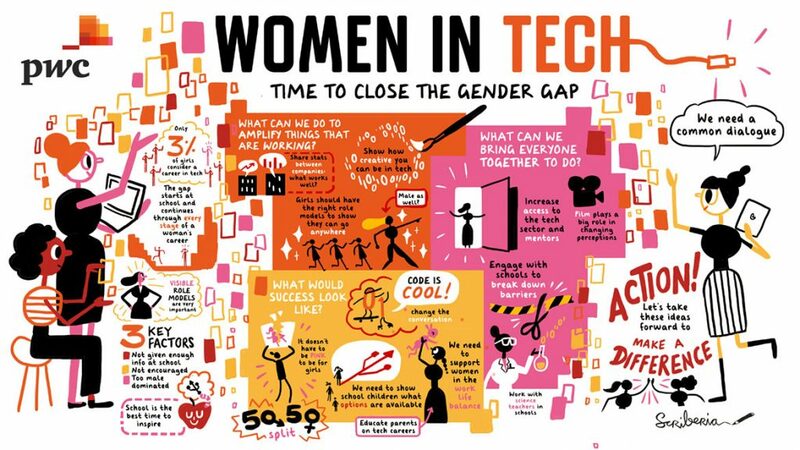 Tech companies should become more involved in the recruitment process, by encouraging employees to check their network, make personal connections on social media and partner with female-friendly recruitment agencies, such as Women in Technology. When women see a company rewarding their values, instead of punishing them, they will become an asset to the business. In turn, by taking this approach tech firms should see an influx in female applicants. What’s the dress code for working in a law firm?